We are two fifths of the way through the season, and the Marlins have played 30 home games in their newly modified home ballpark. They had two goals this winter when they decided to modify their park; more home runs, and giving outfielders the opportunity to make exciting, home run robbing catches, which was nearly impossible given the original dimensions and near ubiquitous 11.5 foot high walls. 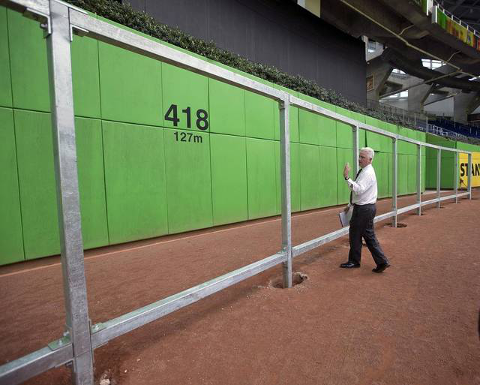 The Marlins moved the center field fence in about 3-20 feet, reducing the deepest area of the ballpark from 418 feet to 407, whilst simultaneously dropping the height of the wall from 11.5 to 8.5 feet. This change takes part over a large curved section of the outfield wall, as you can see in the two images below. My sketch of the change to center field. This is a rough estimate I created using the best information available to me. You can see the original fence in blue, and the new fence in black. The fences diverge around the 392 marker in right center field, wrap around center field, and connect again on the plinth of the home run sculpture. By my estimate, the new fence is roughly 20 feet shorter at the plinth, although there is a lot of odd curvature going on so the exact number may not be important. The Marlins also reduced the height of their walls as much as they could. Some areas around the park contain integral digital scoreboards along the whole height of the outfield wall, so they were not able to reduce the height of these areas. 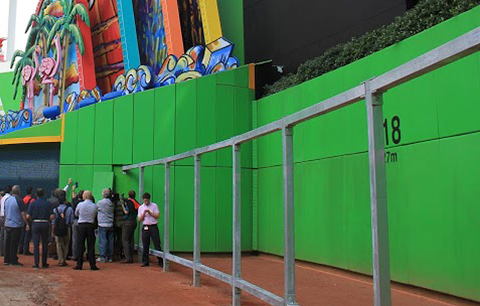 However, in the areas that could be reduced, the left field fences in front of the Clevelander were reduced to 7 feet, while right and center field are now 8.5 feet. Marlins Park wall heights labelled. These changes make sense on paper, and they were welcomed by fans and players alike. Lets get into the actual game results. Here are the home run and run totals for 2015 and 2016 in Marlins Park. Note that the runs in this case are runs scored via the home run. There have been eighteen more home runs this season, and twenty four more runs. That points to a strong step in the right direction. These numbers do not paint the whole picture, though, there are a lot of factors that could result in a surge of offensive performance. Marcell Ozuna has had a great start to his season, for example. He has hit six of the Marlins home runs, registering nine RBIs. A solid quarter of their home run production, and a huge leap forward from his performance in 2015, which began so poorly was sent in AAA. Getting back to the home run data, here is an image I created for all 46 home runs so far this season in Marlins Park. I created this by hand by going through tape with a seating chart, and placing home runs where they landed across the stadium. The red dots represent home runs that would have been home runs regardless of the fence change, and the yellow dots represent home runs gained as a result of the fence changes. First, wow, look at that bomb in center field. I don’t need to tell you Stanton hit that. That is a 475 foot homer. Fun fact, there are 475 feet between home plate and the outer wall of the park. Second, there are five yellow dots, so a few home runs added by moving in the fences. Third, one of those yellow dots is not like the others. Four of those new homers landed in the gap left by moving in the center field fences, that lonely one in right field is different. It instead benefited from the shorter height of the fences. More on that in a moment. Finally, look at that gap between the left field wall and the home runs in left field. None of these home runs are wall scrappers. None of them come close to the wall. These are all 390+ foot bombs. This chart makes you question what is going on in this stadium, why aren’t there any balls landing between the fence and that seating area above the Clevelander? Four balls landed short of that seating area, and each of them hit the facing, which is about 390 feet out and maybe 20 feet high. It is hard to pull off those wall climbing catches when balls are flying 15-30 feet over the wall. There is one ball that was withing jumping distance in right field. Here is a gif of that play. It certainly could have been caught, but it is a very difficult play. There are roughly 33 home runs that went over an area of the field where the fences are shortened to either 7 or 8.5 feet, and one of them, only one of them, could have been played by the outfielder. All of the others left the field by a large margin. I track home runs in this same sort of manner for Citi Field, I have done so for the past few years, and this is a very weird concept for me to wrap my head around. Many of the home runs in Citi Field leave the park by a small margin, maybe 1 or 2 rows of seats. What you see here in Marlins Park is totally, totally different. These balls are leaving by a huge margin. 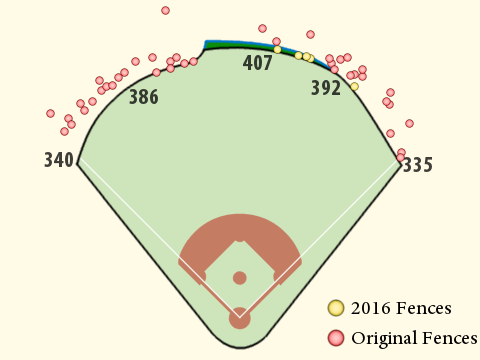 If this pattern of home runs is their normal baseline, you really have to question the wisdom of merely lowering the fences in left field. I admit, I don’t follow home runs in Marlins Park very closely, so maybe over the course of the past few years there have been many more balls that barely passed over that left field fence. 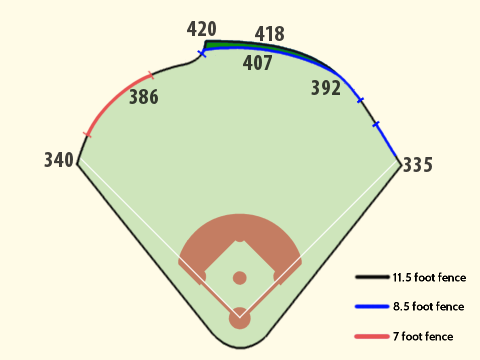 As for center field, four additional home runs might be about what you’d expect from bringing in the walls only, about, 8 feet on average over that length of the outfield. The Mets made a similar change to a similar area of their ball park last season, and there was an increase of 14 home runs. Oddly enough, two of which were hit by Stanton. Stanton has also hit one of the four in Marlins Park. Naturally, there is always criticism when a team moves in their fences, and the Marlins are no exception. Many have spoken out about the Marlins only moving in the one section in center field. Looking at the home run patterns so far this season, it is easy to understand the Marlins hesitation to bring the fences in further. I don’t know exactly what the distribution of fly balls short of that left field fence looks like, I don’t have a method of easily and accurately mapping it out. I can plot out the landing coordinates given by gameday, and in doing so I have found a large and pronounced gap in landing locations in left field, but the gameday coordinates are not accurate or necessarily reliable. It could be that moving in the fences in left field modestly, 5 to 10 feet, would add little, if any, additional home runs, while moving it in aggressively might add too many. Maybe there is a phenomena, air conditioning, convection currents, whatever it may be, that is grabbing balls hit above a certain height, or on a certain angle, and pushing them out into deep left field. Presumably, balls hit below that necessary height or angle aren’t gaining any benefit at all, which could leave a large gap between the balls that are boosted and those which are not. It could be that the left field wall is located somewhere within that dead zone. But, this is all speculation, I don’t know what forces are at work or the distribution of fly balls, so I can only guess. It seems like Marlins Park may end up being one of the more difficult stadiums to adjust. Moving in the fences may not be a realistic option, so they may have to turn to more creative alternatives. Or, perhaps, learn to live with the park the way it is. We hoped you liked reading A look into the new Marlins Park dimensions. by Andrew Perpetua! This was phenomenal…and a staggering amount of work, I think. Thank you! I glad you liked it. It definitely took some time to go through the video, and I learned a few things along the way. For instance, I had no idea Yelich had as much power as he does. He has hit the ball a very long way on more than one occasion, almost as far as Stanton. Ozuna, too. Those three guys have serious muscle when they square up a ball. I always pegged Yelich as a guy with pop who will shoot them over the fence, not as a guy hitting 440 foot moon shots. Yelich has a little spot in right center, if you look at the second deck, the 4th section in from the foul pole. He has hit a few homers there this season, it is about 415 feet out. That’s some serious power.